George Gamow was one of the “quantum kids” who got their start at the Niels Bohr Institute in the 30’s. He’s probably best known for the Alpher, Bethe, Gamow paper, which managed to combine one of the best sources of evidence we have for the Big Bang with a gratuitous Greek alphabet pun. He was the group jester in a lot of ways: the historians here have archives full of his cartoons and in-jokes. Naturally, he also did science popularization. I recently read two of Gamow’s science popularization books, “Mr Tompkins” and “Thirty Years That Shook Physics”. Reading them was a trip back in time, to when people thought about physics in surprisingly different ways. “Mr. Tompkins” started as a series of articles in Discovery, a popular science magazine. They were published as a book in 1940, with a sequel in 1945 and an update in 1965. Apparently they were quite popular among a certain generation: the edition I’m reading has a foreword by Roger Penrose. Mr Tompkins himself is a bank clerk who decides on a whim to go to a lecture on relativity. Unable to keep up, he falls asleep, and dreams of a world in which the speed of light is much slower than it is in our world. Bicyclists visibly redshift, and travelers lead much longer lives than those who stay at home. As the book goes on he meets the same professor again and again (eventually marrying his daughter) and sits through frequent lectures on physics, inevitably falling asleep and experiencing it first-hand: jungles where Planck’s constant is so large that tigers appear as probability clouds, micro-universes that expand and collapse in minutes, and electron societies kept strictly monogamous by “Father Paulini”. The structure definitely feels dated, and not just because these days people don’t often go to physics lectures for fun. Gamow actually includes the full text of the lectures that send Mr Tompkins to sleep, and while they’re not quite boring enough to send the reader to sleep they are written on a higher level than the rest of the text, with more technical terms assumed. In the later additions to the book the “lecture” aspect grows: the last two chapters involve a dream of Dirac explaining antiparticles to a dolphin in basically the same way he would explain them to a human, and a discussion of mesons in a Japanese restaurant where the only fantastical element is a trio of geishas acting out pion exchange. Some aspects of the physics will also feel strange to a modern audience. Gamow presents quantum mechanics in a way that I don’t think I’ve seen in a modern text: while modern treatments start with uncertainty and think of quantization as a consequence, Gamow starts with the idea that there is a minimum unit of action, and derives uncertainty from that. Some of the rest is simply limited by timing: quarks weren’t fully understood even by the 1965 printing, in 1945 they weren’t even a gleam in a theorist’s eye. Thus Tompkins’ professor says that protons and neutrons are really two states of the same particle and goes on to claim that “in my opinion, it is quite safe to bet your last dollar that the elementary particles of modern physics [electrons, protons/neutrons, and neutrinos] will live up to their name.” Neutrinos also have an amusing status: they hadn’t been detected when the earlier chapters were written, and they come across rather like some people write about dark matter today, as a silly theorist hypothesis that is all-too-conveniently impossible to observe. “Thirty Years That Shook Physics”, published in 1966, is a more usual sort of popular science book, describing the history of the quantum revolution. While mostly focused on the scientific concepts, Gamow does spend some time on anecdotes about the people involved. If you’ve read much about the time period, you’ll probably recognize many of the anecdotes (for example, the Pauli Principle that a theorist can break experimental equipment just by walking in to the room, or Dirac’s “discovery” of purling), even the ones specific to Gamow have by now been spread far and wide. Both books are filled with Gamow’s whimsical illustrations, something he was very much known for. Apparently he liked to imitate other art styles as well, which is visible in the portraits of physicists at the front of each chapter. 1966 was late enough that this book doesn’t have the complacency of the earlier chapters in Mr Tompkins: Gamow knew that there were more particles than just electrons, nucleons, and neutrinos. It was still early enough, though, that the new particles were not fully understood. It’s interesting seeing how Gamow reacts to this: his expectation was that physics was on the cusp of another massive change, a new theory built on new fundamental principles. He speculates that there might be a minimum length scale (although oddly enough he didn’t expect it to be related to gravity). It’s only natural that someone who lived through the dawn of quantum mechanics should expect a similar revolution to follow. Instead, the revolution of the late 60’s and early 70’s was in our understanding: not new laws of nature so much as new comprehension of just how much quantum field theory can actually do. I wonder if the generation who lived through that later revolution left it with the reverse expectation: that the next crisis should be solved in a similar way, that the world is quantum field theory (or close cousins, like string theory) all the way down and our goal should be to understand the capabilities of these theories as well as possible. The final section of the book is well worth waiting for. In 1932, Gamow directed Bohr’s students in staging a play, the “Blegdamsvej Faust”. A parody of Faust, it features Bohr as god, Pauli as Mephistopheles, and Ehrenfest as the “erring Faust” (Gamow’s pun, not mine) that he tempts to sin with the promise of the neutrino, Gretchen. The piece, translated to English by Gamow’s wife Barbara, is filled with in-jokes on topics as obscure as Bohr’s habitual mistakes when speaking German. It’s gloriously weird and well worth a read. If you’ve ever seen someone do a revival performance, let me know! This entry was posted in Misc and tagged history of science, quantum mechanics, science communication, science fiction on January 25, 2019 by 4gravitonsandagradstudent. Lubos Motl has responded to my post from last week about the recent Caltech short, Quantum is Calling. His response is pretty much exactly what you’d expect, including the cameos by Salma Hayek and Kaley Cuoco. The only surprise was his lack of concern for accuracy. Quantum is Calling got the conjecture it was trying to popularize almost precisely backwards. I was expecting that to bother him, at least a little. That depends on what you think Quantum is Calling is trying to do. Science popularization, even good science popularization, tends to get things wrong. Some of that is inevitable, a result of translating complex concepts to a wider audience. Sometimes, though, you can’t really chalk it up to translation. Interstellar had some extremely accurate visualizations of black holes, but it also had an extremely silly love-powered tesseract. That wasn’t their attempt to convey some subtle scientific truth, it was just meant to sound cool. And the thing is, that’s not a bad thing to do. For a certain kind of piece, sounding cool really is the point. Imagine being an explorer. You travel out into the wilderness and find a beautiful waterfall. One option is the press. The news can cover your travels, so people can stay up to date with the latest in waterfall discoveries. In general, you’d prefer this sort of thing to be fairly accurate: the goal here is to inform people, to give them a better idea of the world around them. Alternatively, you can advertise. You put signposts up around town pointing toward the waterfall, complete with vivid pictures. Here, accuracy matters a lot less: you’re trying to get people excited, knowing that as they get closer they can get more detailed information. In science popularization, the “news” here isn’t just news. It’s also blog posts, press releases, and public lectures. It’s the part of science popularization that’s supposed to keep people informed, and it’s one that we hope is mostly accurate, at least as far as possible. The “signposts”, meanwhile, are things like Interstellar. Their audience is as wide as it can possibly be, and we don’t expect them to get things right. They’re meant to excite people, to get them interested in science. The expectation is that a few students will find the imagery interesting enough to go further, at which point they can learn the full story and clear up any remaining misconceptions. Quantum is Calling is pretty clearly meant to be a signpost. The inaccuracy is one way to tell, but it should be clear just from the context. We’re talking about a piece with Hollywood stars here. The relative star-dom of Zoe Saldana and Keanu Reeves doesn’t matter, the presence of any mainstream film stars whatsoever means they’re going for the broadest possible audience. They’re also quite explicit about their goals. The piece’s predecessor has Keanu Reeves send a message back in time, with the goal of inspiring a generation of young scientists to build a future paradise. They’re not subtle about this. Ok, so what’s the problem? Signposts are allowed to be inaccurate, so the inaccuracy shouldn’t matter. Eventually people will climb up to the waterfall and see it for themselves, right? What if the waterfall isn’t there? The evidence for ER=EPR (the conjecture that Quantum is Calling is popularizing) isn’t like seeing a waterfall. It’s more like finding it via surveying. By looking at the slope of nearby terrain and following the rivers, you can get fairly confident that there should be a waterfall there, even if you can’t yet see it over the next ridge. You can then start sending scouts, laying in supplies, and getting ready for a push to the waterfall. You can alert the news, telling journalists of the magnificent waterfall you expect to find, so the public can appreciate the majesty of your achievement. What you probably shouldn’t do is put up a sign for tourists. As I hope I made clear in my last post, ER=EPR has some decent evidence. It hasn’t shown that it can handle “foot traffic”, though. The number of researchers working on it is still small. (For a fun but not especially rigorous exercise, try typing “ER=EPR” and “AdS/CFT” into physics database INSPIRE.) Conjectures at this stage are frequently successful, but they often fail, and ER=EPR still has a decent chance of doing so. Tying your inspiring signpost to something that may well not be there risks sending tourists up to an empty waterfall. They won’t come down happy. As such, I’m fine with “news-style” popularizations of ER=EPR. And I’m fine with “signposts” for conjectures that have shown they can handle some foot traffic. (A piece that sends Zoe Saldana to the holodeck to learn about holography could be fun, for example.) But making this sort of high-profile signpost for ER=EPR feels irresponsible and premature. 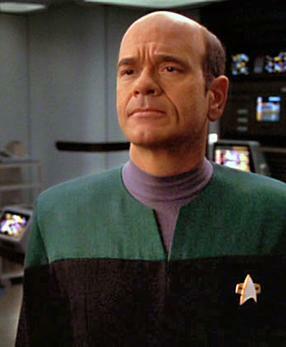 There will be plenty of time for a Star Trek tie-in to ER=EPR once it’s clear the idea is here to stay. This entry was posted in Science Communication and tagged press, PublicPerception, quantum field theory, quantum gravity, science communication, science fiction, theoretical physics on January 6, 2017 by 4gravitonsandagradstudent. There’s a theme in a certain kind of science fiction. Not in the type with laser swords and space elves, and not in cyberpunk dystopias…but when sci-fi tries to explore what humanity might do if it really got a chance to explore its own capabilities. In a word, the theme is scale. We start out with a Dyson sphere, built around our own sun to trap its energy. As time goes on, the projects get larger and larger, involving multiple stars and, eventually, reshaping the galaxy. There’s an expectation, though, that this sort of thing is far in our future. Treating the galaxy as a resource, as a machine, seems well beyond our present capabilities. On Wednesday, Victoria Kaspi gave a public lecture at Perimeter about neutron stars. At the very end of the lecture, she talked a bit about something she covered in more detail during her colloquium earlier that day, called a Pulsar Timing Array. Neutron stars are one of the ways a star can end its life. Too big to burn out quietly and form a white dwarf, and too small to collapse all the way into a black hole, the progenitors of neutron stars have so much gravity that they force protons and electrons to merge, so that the star ends up as a giant ball of neutrons, like an enormous atomic nucleus. Many of these neutron stars have strong magnetic fields. A good number of them are what are called pulsars: stars that emit powerful pulses of electromagnetic radiation, often at regular intervals. Some of these pulsars are very regular indeed, rivaling atomic clocks in their precision. The idea of a Pulsar Timing Array is to exploit this regularity by using these pulsars as a gravitational wave telescope. Gravitational waves are ripples in space-time. They were predicted by Einstein’s theory, and we’ve observed their indirect effects, but so far we have yet to detect them directly. Attempts have been made: vast detectors like LIGO have been built that bounce light across long “arms”, trying to detect minute disruptions in space. The problem is, it’s hard to distinguish these disruptions from ordinary vibrations in the area, like minor earthquakes. Size also limits the effectiveness of these detectors, with larger detectors able to see the waves from bigger astronomical events. Pulsar Timing Arrays sidestep both of those problems. Instead of trying to build a detector on the ground like LIGO (or even in space like LISA), they use the pulsars themselves as the “arms” of a galaxy-sized detector. Because these pulsars emit light so regularly, small disruptions can be a sign that a gravitational wave is passing by the earth and disrupting the signal. Because they are spread roughly evenly across the galaxy, we can correlate signals across multiple pulsars, to make sure we’re really seeing gravitational waves. And because they’re so far apart, we can use them to detect waves from some of the biggest astronomical events, like galaxies colliding. Earth very much not to scale. Longtime readers know that I find astronomy really inspiring, but Kaspi’s talk woke me up to a completely different aspect, that of our mastery of scale. Want to dream of a future where we use the solar system and the galaxy as resources? We’re there, and we’ve been there for a long time. We’re a civilization that used nearby planets to bootstrap up the basic laws of motion before we even had light bulbs. We’ve honed our understanding of space and time using distant stars. And now, we’re using an array of city-sized balls of neutronium, distributed across the galaxy, as a telescope. If that’s not the stuff of science fiction, I don’t know what is. By the way, speaking of webcast lectures, I’m going to be a guest on the Alda Center’s Science Unplugged show next week. Tune in if you want to hear about the sort of stuff I work on, using string theory as a tool to develop shortcuts for particle physics calculations. This entry was posted in Astrophysics/Cosmology and tagged astronomy, astrophysics, black hole, gravity, science fiction on February 5, 2016 by 4gravitonsandagradstudent. On Wednesday, Amanda Peet gave a Public Lecture at Perimeter on string theory and black holes, while I and other Perimeter-folk manned the online chat. If you missed it, it’s recorded online here. We get a lot of questions in the online chat. Some are quite insightful, some are basic, and some…well, some are kind of strange. Like the person who asked us how holography could be compatible with irrational numbers. In physics, holography is the idea that you can encode the physics of a wider space using only information on its boundary. If you remember the 90’s or read Buzzfeed a lot, you might remember holograms: weird rainbow-colored images that looked 3d when you turned your head. On a computer screen, they instead just look awkward. Holograms in physics are a lot like that, but rather than a 2d image looking like a 3d object, they can be other combinations of dimensions as well. The most famous, AdS/CFT, relates a ten-dimensional space full of strings to a four-dimensional space on its boundary, where the four-dimensional space contains everybody’s favorite theory, N=4 super Yang-Mills. So from this explanation, it’s probably not obvious what holography has to do with irrational numbers. That’s because there is no connection: holography has nothing to do with irrational numbers. Naturally, we were all a bit confused, so one of us asked this person what they meant. They responded by asking if we knew what holograms and irrational numbers were. After all, the problem should be obvious then, right? In this sort of situation, it’s tempting to assume you’re being trolled. In reality, though, the problem was one of the most common in science communication: people can’t tell you what they don’t understand, because they don’t understand it. When a teacher asks “any questions?”, they’re assuming students will know what they’re missing. But a deep enough misunderstanding doesn’t show itself that way. Misunderstand things enough, and you won’t know you’re missing anything. That’s why it takes real insight to communicate science: you have to anticipate ways that people might misunderstand you. In this situation, I thought about what associations people have with holograms. While some might remember the rainbow holograms of old, there are other famous holograms that might catch peoples’ attention. 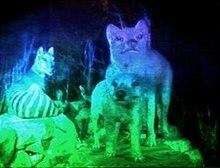 In science fiction, holograms are 3d projections, ways that computers can create objects out of thin air. The connection to a 2d image isn’t immediately apparent, but the idea that holograms are digital images is central. Digital images are the key, here. A computer has to express everything in a finite number of bits. It can’t express an irrational number, a number with a decimal expansion that goes on to infinity, at least not without tricks. So if you think that holography is about reality being digital, rather than lower-dimensional, then the question makes perfect sense: how could a digital reality contain irrational numbers? This is the sort of thing we have to keep in mind when communicating science. It’s easy to misunderstand, to take some aspect of what someone said and read it through a different lens. We have to think about how others will read our words, we have to be willing to poke and prod until we root out the source of the confusion. Because nobody is just going to tell us what they don’t get. This entry was posted in Science Communication and tagged science communication, science fiction, string theory on May 8, 2015 by 4gravitonsandagradstudent.